Jim Milledge has just completed a memoir entitled "Mountains My Lab". Although not intended for publication, Jim has given STDZ permission to reproduce extracts on our blog. During 2019 we'll bring you images and text that describe the extraordinary life of one of mountain medicine's leading figures. Part 1 and Part 2 can be found in earlier posts. 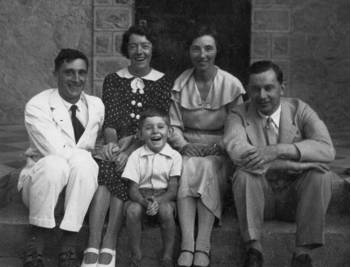 We came back to Britain in 1936 after my parents had served their first term of seven years in China. We travelled by P&O liner from Shanghai and stopped off in India for a holiday with Greville and Nansi Young, and my cousins Jill and Terry. Jill was a year older and Terry a year younger than me. We had a wonderful three weeks with them at their home in central India. Then on again via the Suez Canal to Port Said where we left the boat to visit Emrys and Peggy Thomas (my uncle and aunt) in Damascus. They were both doctors and worked at the Victoria Hospital there supported by the Edinburgh Medical Missionary Society. An incident I remember there was to do with a large leather pouf of the type sold in the Middle East with ridges or corrugations round the edge. I was playing with this while the grown-ups chatted amongst themselves. I knew about tanks with caterpillar tracks, which enabled them to climb up over obstacles and, in my five-year old mind, I wondered if the pouf could be made to do the same. I rolled it to the bottom of the stairs (it was much too heavy for me to lift) and tried to see if it would grip the stair edges as I rolled it up. It did and I rolled it up the first flight of stairs to the landing second flight to the top. I was very pleased with myself! Now for the controlled descent. Of course, being so heavy it got away from me almost immediately. The landing stopped short of the back wall leaving a 2-foot space between it and the wall in which was a large window from floor to ceiling. On the landing was a pair of large brass ornamental vases. I watched in appalled horror as the pouf gathered speed and smashed into both vases sending them crashing through the gap down to the ground floor below! Alerted by the awful din, all the grown-ups came running. However, I got away without much telling off because they were so relieved that I was not hurt; although the vases were damaged beyond repair. My Aunt disliked them but, as they were a present, she could not dispose of them, so actually she was quite pleased: lucky Jim! For the black bat night hath flown. For I’m here at the gate alone! My Uncle Alun was a bachelor and had, at this time, a welsh girl friend called Neste. Either because she liked me or more possibly to improve her standing with our family, she took me over to Liverpool for a treat, including tea at one of the teashops fashionable at the time. It was a large tearoom full of customers and during one those lulls in the background chatter, I apparently piped up in my 6-year-old penetrating treble, “When I was in China…” Heads swivelled in our direction. Another lull: I piped up again, “When I was in India…” More surprised looks, Neste tried to look nonchalant. A third lull and “When I was in Damascus…” I added. Neste didn’t know where to look. But she told the story against herself to my mother on our return! We all attended a Congregational church near Alun’s house and it must have been there that I first heard the reading from Isaiah of his vision in the temple and his call to be a prophet. I could well imagine the awesome scene. The part that puzzled me was about the angels. The reading was, of course, from the King James Bible, “Above him stood the seraphim: each one has six wings; with twain he covered his face, with twain he covered his feet and with twain he did fly”. What was this stuff twain? I knew twine was a kind of thread so I guessed that twain was probably a sort of material woven from twine and so suitable for covering the face and feet and, if you had wings, presumably you could cover them with twain too and thus fly! The Japanese, who had already invaded Manchuria, decided, in 1937 to invade North China. Tsang Chow was obviously threatened and it was decided that my father should hurry back and try and get there before the Japanese. I remember waiving him off on the train and my mother crying. He travelled the then fastest way, via the trans-Siberian railway, which took only two weeks instead of the six weeks by sea. However, the Japanese beat him to Tsang Chow. He spent time in Tiensin but got through eventually. The situation was quite chaotic with the Japanese controlling the main towns whilst the countryside was a sort of no-man’s-land with various Chinese resistance groups, nationalist, communist and others moving in and out as their fortunes fluctuated. But then this was not so very different from the situation in my parents first term of service when it was the warlords fighting it out amongst themselves. I was largely unaware of all this as I started school at the age of six at a local private school for two years before going to my father’s old school, Eltham College, as a boarder at the age of eight. Eltham was originally set up as the “School for the Sons of Missionaries” and so was free or heavily subsidised for my parents. It was situated in the South East suburb of London in Mottingham. It was an independent school with a boarding section of about a hundred boys from eight to eighteen and there were about three hundred day boys drawn from the locality. We youngest boarders were in a separate small house and I remember being very happy during that first year at Eltham. That first term there was the excitement of the Munich crisis when the imminence of war was sufficient for us to be evacuated to Taunton School for a few days until Chamberlain came back with his piece of paper ensuring “peace in our time”. Hitler promised that this land grab of part of Czechoslovakia was his last territorial claim. The Youngs, Greville and Nansi, Jill and Terry who had returned from India that summer now augmented our extended family. 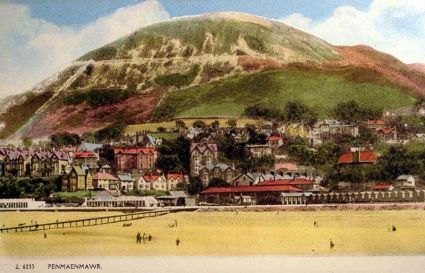 We had all gone for a seaside holiday in August to the North Wales village of Penmaenmawr. With war looming, the grown-ups decided that we should evacuate ourselves from Birkenhead to the country and during the holiday they found a house to rent in Penmaenmawr. So after hearing the news of the declaration of war during the Sunday morning service at the English Congregational Church, plans were made to move to this house, Crofton, which became my home for the next ten years and more. At the end of the summer holidays in 1939 instead of going back to Eltham, I was sent to Taunton where again the boarders and some dayboys from Eltham had been evacuated. The senior boys were numerous enough to have their own “house” with an Eltham master in charge. We juniors were not so fortunate. Boys can be cruel at that age and we were made to feel unwanted refugees and it was not a happy experience. But the worst time was the second term when I went back to school after the Christmas holidays. I said goodbye to my mother as my train pulled out of Crewe station and I knew it would be some years before I saw her again. She was going to join my father in Japanese occupied China. Uncle Alun went with her as far as Hong Kong, to work in the Nethersole Hospital there, also under the London Missionary Society. It may seem incredible, looking back, that she and my Uncle should go out in the middle of the war. But, of course, Britain was not at war with Japan and the view was that Japan had already bitten off more than it could chew with China. Pearl Harbour was still almost two years off when Mum and Alun sailed for China in January 1940 during the “phoney war”. When Japan bombed Pearl Harbour in December 1941 and USA and Britain declared war on Japan, my parents, in Japanese occupied China became “enemy aliens”. This made little difference at first. Dad went on working in the hospital in Tsang Chow. But after a while they were ordered to go to the British concession, an area of Tenzin, with all other British in North China. Then they were offered a chance of repatriation to the UK with the Consular party from Shanghai. However, when they arrived in Shanghai they found they had been removed from the Consular list in favour of British business people from Shanghai. They were told they would be on the next ship. But, of course, there never was a next ship and they spent the rest of the war in a succession of internment camps in and near Shanghai. They were not ill treated by the Japanese but the cramped conditions, lack of privacy and poor food were tough. Communication was limited to 25-word Red Cross letters, which arrived irregularly. Unlike Japanese prisoner of war camps, they were able to organise themselves within the camps with a camp committee of internees. With diverse talents amongst the inmates, they were able to organise schools, choirs, entertainments as well as duties, such as cooking, cleaning, firing the boiler etc. My father worked as the camp doctor and occasionally was allowed to visit other camps to give medical advice. In 1943 my brother, David, was born and my mother was allowed to go into a hospital in Shanghai to give birth. There was, of course great rejoicing when the war ended after the 2 atomic bombs were dropped on Japan and they soon came home by sea to join us in Penmaenmawr. A short time later my uncle Alun, his wife Jean and their daughter Marge (born on a hospital ship on the way home) joined us. 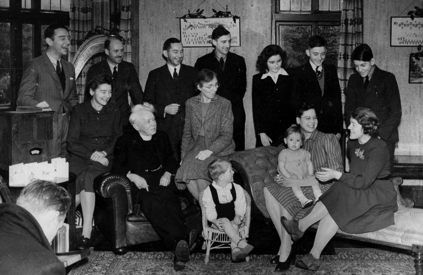 So for Christmas 1945 we were indeed a very happy family. Christmas 1945. (Left to Right) Back Row - Alun, Greville, Emrys, Dad, Jill, Terry, Myself. Front Row - Nansi, Grandpa, Peggy, David, Marge, Jean, Miriam. Going back to 1940, my time at Thone (the Prep school for Taunton) aged nine was the most unhappy period of my life, so I was very pleased when, in the Summer holidays of 1940, Nansi and Greville, now my guardians, decided that, with the blitz starting on London, it was foolish to send a boy all the way from North Wales to Taunton via London and wiser to send me to a school in Colwyn Bay. So it was that in September 1940, I went, with Terry, to Rydal Junior (Prep) School. Terry had been there a year and so introduced me to his friends and immediately I felt at home.